ATC BLADE FUSE 3 AMP 30 PCS/BAG. Each fuse is printed with the Rated Current in Amperes on the top. Very often there is more than one part available per application as auto makers often switch midyear. ATC BLADE FUSE 40 AMP 30 PCS/BAG. Each fuse is printed with the Rated Current in Amperes on the top. Very often there is more than one part available per application as auto makers often switch midyear. 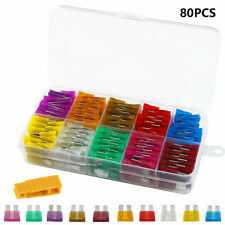 120 PCS X Small Size Blade Fuse. - Fuse Puller Included. 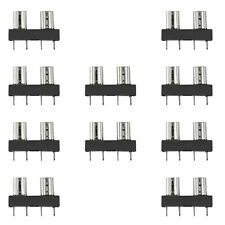 - 15 AMP X 12 PCS. - 20 AMP X 12 PCS. - 25 AMP X 12 PCS. - 10 AMP X 12 PCS. - 30 AMP X 12 PCS. - 2 AMP X 12 PCS. 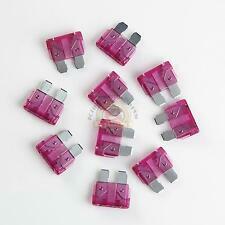 ATC BLADE FUSE 10 AMP 30 PCS/BAG. Each fuse is printed with the Rated Current in Amperes on the top. Very often there is more than one part available per application as auto makers often switch midyear. 120 PCS X Small Size Blade Fuse. - 1X Fuse Puller. - 15 AMP X 12 PCS. - 20 AMP X 12 PCS. - 25 AMP X 12 PCS. - 10 AMP X 12 PCS. - 30 AMP X 12 PCS. - 2 AMP X 12 PCS. 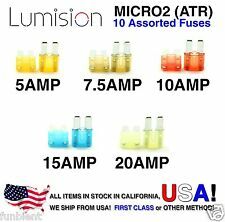 Assorted ATR Micro2 Automotive Fuses, 10 pcs total. Type: Micro2 Fuse. Micro2 blade type fuses. Space saving - allows more fuses to fit in smaller space. Item Information Volts: 32V. Easy installation and transparent shell for quick detection of blown fuses. 10 kinds of most common fuse: 3A/5A/7.5A/10A/15A/20A/25A/30A/35A/40A, each type includes 8 pcs, different AMP in different color and AMP numbers carved on the fuse for easy recognition. Used In Fuse Panels And Wiring Harnesses Of Newer Cars And Trucks. Set Includes 4pcs 80 Amp. 4pcs 60 Amp. 4pcs 50 Amp. The seven most common APM ATM blade fuses in cars, trucks, boats, etc. 20-pc - 15 Amp. 20-pc - 25 Amp. 20-pc - 20 Amp. Color coded for easy identification. 20-pc - 10 Amp. 20-pc - 30 Amp. The fuse will automatically blow current when the current rises abnormally and reaches a certain height. Thereby functioning to protect the circuit and operate safely. It will be more convenient and safe in use. Made By GOLIATH INDUSTRIAL TOOL. 20pcs 10 Amp. 20pcs 30 Amp. 20pcs 25 Amp. 20pcs 25 amp. 20pcs 20 amp. 20pcs 15 amp. WE HAVE ATC FUSE HOLDERS IN 10-18 GAUGE. Very often there is more than one part available per application as auto makers often switch midyear. It may take up to 24 hours for the system to update. ATC BLADE FUSE 30 AMP 25 PCS/BAG. Each fuse is printed with the Rated Current in Amperes on the top. Very often there is more than one part available per application as auto makers often switch midyear. VETOMILE 6-way Fuse Box Blade Fuse Holder 5A 10A 15A 20A Free Fuses LED Indicator Waterpoof Cover for Automotive Car Marine Boat. Wires just connect to the fuse box and fuses just plug in & out, neat and convenient. With red LED warning indicator, If a fuse blows the red LED next to the problem fuse, illuminates allowing for fast and hassle free identification of a fault. Each fuse holder is numbered to make fuse installation and identification as easy as possible. ATC Fuses / Blade Fuses / ATO Fuses / Automotive Fuses 7.5Amp. ATC BLADE FUSE 7.5 AMP30 PCS /BAG. Very often there is more than one part available per application as auto makers often switch midyear. Contains the most commonly replaced fuses for cars, trucks, and SUVs. Includes tester & fuse puller. LOT OF 100 PIECES Violet 3 AMP ATC/ATO STANDARD BLADE FUSE. 100 x 3 Amp Violet ATC/ATO Blade Fuse. Each fuse is printed with rated current in amperes on the top. Designed to fit regular ATC/ATO fuse holders. 1 x 6 Way Blade Fuse Box Holder. 6.3mm fuse holder. High quality 6 way fuse box. Sturdy and robust construction. Clear, vibration resistant, snap fit cover. Can be secured via 2 pre molded holes. Fuses & Fuse Holders. ATC Fuses / Blade Fuses / ATO Fuses / Automotive Fuses 30 Amp 25 count. ATC BLADE FUSE 30 AMP 25 PCS/BAG. Circuit Breakers, Isolator. Trailer Wire. Each fuse is printed with the Rated Current in Amperes on the top. ATC BLADE FUSE 40 AMP 30 PCS/BAG. Each fuse is printed with the Rated Current in Amperes on the top. © 2017 Royal Auto Part. Assorted ATR Micro2 Automotive Fuses, 15 pcs total. Type: Micro2 Fuse. Micro2 blade type fuses. Space saving - allows more fuses to fit in smaller space. Style: Blade Fuse. Misuse of product will void warranty. ATC Automotive Blade 4 Way fuse box. For fuse: 4 middle-sized blade fuses. Automotive fuse box, suitable for middle-sized blade fuses. Fuse current: 1-40A. 1pc x fuse box (fuses are not included). Compact size, sturdy construction. 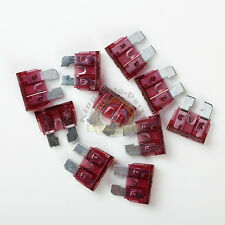 • 10 pcs orange blade fuses 5A 32V. Very often there is more than one part available per application as auto makers often switch midyear. © 2017 King Auto Part Systems. I received your item but it does not fit or is defective. 1 × Yellow Puller 1 × Red Puller 1 × Black Puller. Type: Fuse Puller. Mantis Tri-Rad Adult Folding Tricycle Bike Bicycle Portable Tricycle 20" Wheels. Fit For: Mini or Micro Blade Fuse. New Billet Aluminum Low Profile Napa 4003 Wix 24003 Fuel Filter 1/2-28" 1/2" UE. This is the largest of the blade fuses: MAXI. ABOUT THE ITEM: FOUR factory-new, old-inventory automotive / marina / RV / camper LARGE, green, 30AMP MAXI blade fuses. NUMBER TEST POINTS: Two per fuse. This is the largest of the blade fuses: MAXI. ABOUT THE ITEM: FOUR factory-new, old-inventory automotive / marina / RV / camper LARGE, blue, 60AMP MAXI blade fuses. NUMBER TEST POINTS: Two per fuse. FOR USE WITH MINI ATM/ATC/LFM FUSES ONLY. TO BE USED WITH FEMALE CONNECTOR SIZE. 187 OUR PART # IS FF187 ( RED 22-19 GAUGE WIRE) OR FF100. (BLUE 16-14 GAUGE ). Very often there is more than one part available per application as auto makers often switch midyear. The only difference is the bottom of the fuse is open. This is for (25) 1A ATO fuses. Regular ATO type blade fuses. Used in many automotive applications. Fits for 1 Amp to 30 Amp ATN blade fuse of mini size. In-Line Fuse Holder and Easy to install. 5 x In-Line Fuse Holder. Cable Specifics: 12 AWG red insulated wire, Rated current: 20A, 32V, DC (6V/12V/24V). Input, w/4x 5.5mm Mounting Holes, suitable for #10 screws, easy installation. Car MCircuit Fuse Block. Device Type: 6-way Car Blade Fuse Box. Unique LED Safety Indicator: The indicator light flashes red when the fuse is blown, super easy to check the trouble shooting. Accepts one ATC Fuse. Fuse holder with attached cover. 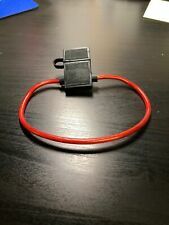 12 Gauge Red Power Wire. THE ONLY DIFFERENCE IS THE ATO FUSES ARE OPEN AT THE BOTTOM. (25) 3 AMP ATO Automotive Blade Fuses. Fits regular ATO and ATC type blade fuse holders. Used in many automotive applications. LOT OF 100 PIECES Tan 5 AMP ATC/ATO STANDARD BLADE FUSE. 100 x 5 Amp Tan ATC/ATO Blade Fuse. Each fuse is printed with rated current in amperes on the top. Designed to fit regular ATC/ATO fuse holders. 6-Way Blade Fuse Block: Each fuse holder is numbered to make fuse installation and identification as easy as possible. There are unique LED indicator lights of each circuit that flash red if the fuse is blown. 4 Qty. 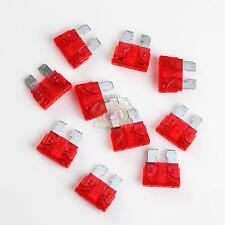 ATM 10A Mini Blade Automotive Fuse 10 Amp 10amp Red. Condition is New. Shipped with USPS First Class Envelope. These fuse boxes are suitable for use in automotive and marine applications - each fuse holder is numbered to make fuse installation and identification as easy as possible. On the fuse box is a red LED which illuminates when a fuse has blown, an earth is not required for this the fuse boxes illuminate when they detect a short circuit. Trending at $13.43eBay determines this price through a machine learned model of the product's sale prices within the last 90 days. Use these to add a wire on to an existing fuse. For Automotive 12 volt use. THIS IS FOR A QTY (50) PIECES OF 30 AMP ATM MINI BLADE STYLE FUSES. The only difference is the bottom of the fuse is open. This is for (25) 10A ATO fuses. Regular ATO type blade fuses. Used in many automotive applications.